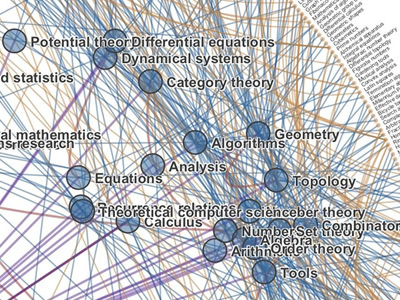 Chris Harrison is a prolific researcher who has done some great data visualization projects. Among them is ClusterBall. This visualization shows the structure of three levels of Wikipedia category pages and their interconnections. Centered in the graph is the parent node, in this case, Medicine (first image). Pages that are linked from this parent node are rendered inside the ball. 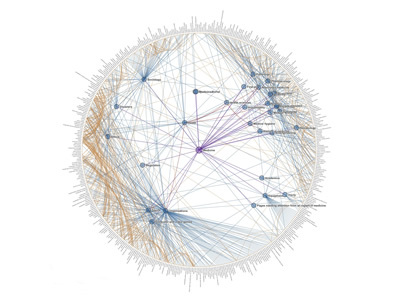 Finally, pages that are linked to the latter (secondary) nodes are rendered on the outer ring. Links between category pages are illustrated by edges, which are color coded to represent their depth from the parent node. Nodes are clustered such that edge lengths are minimized. This forces highly connected groups of pages to clump together, essentially forming topical groups. The center acts as an anchor while the ring provides a fixed perimeter. This allows the secondary, super-categories to "float" above clusters. The clustering component of this visualization is vital. As Chris explains: "The mere presence of information isn't all that interesting; there is no context or relevance to be gleaned. However, the structure of information is revealing about where fields intersect and diverge, and ultimately about how humans organize information". The first image shows Medicine as the parent node, while the second features a detail view into the Mathematics category page.